Returning to their normal vigorous states after vanquishing the Master, Henry Gordon Jago and Professor George Litefoot once more embark upon a perilous quest to explore and put right a series of wrongs plaguing Victorian London, this time as a long-quiescent menace resurfaces. Ellie’s vampiric nature was one of the more intriguing elements of the early series of Jago & Litefoot, and following a lengthy period of dormancy following Litefoot’s dogged determination to find a cure, this seems a fitting time to further explore that element now that the Master has allowed it to resurface. ‘Picture This’ by Justin Richards opens this twelfth series as Ellie ominously forces her way into the mysterious Scarlet Gallery, a place which Inspector Quick soon calls Jago and Litefoot to following the discovery of a murdered corpse and a stolen painting. This gallery instantly presents an immensely atmospheric and enigmatic environment that stands up amongst this range’s best, the visual of paintings of mystical scenes hanging alongside others supposedly imbued with special properties as frames rattle to perhaps suggest that those within the canvases are trying to escape wonderfully playing on the fearful proposition of being watched by unseen and unknown forces. Murders and disappearances feature in just about every instalment of this range, and so the manner by which the gallery and the physical changes to certain visitors link up is refreshingly novel and quite unexpected given the story’s initial setup. With even Litefoot himself not immune to the nefarious goings-on, the resultant confrontation where even something as simple as a touch can spell defeat carries with it a brilliant danger and emotional weight that Christopher Benjamin and Conrad Asquith act out perfectly. ‘Picture This’ uses its setting and central concept to great effect to present a unique spin on a trusted type of menace that has been around much longer than anyone could have imagined, and though the repercussions of the lives found and saved are not dealt with, Ellie seeing for herself the personal content of a very specific painting that ties into the very first beginnings of this range is sure to have decisive consequences going forward. ‘The Flickermen’ by Paul Morris and Simon Barnard follows suit by using the novel theatrograph technology of moving pictures to present another ominous and unique threat. Seeing cinematography as an upcoming threat to his theatre, Jago is all too willing to take in a demonstration at the local fairgrounds, but the connections to mysterious disappearances and the local fables of the haunting flickermen become all too overt when a prank at the investigators’ expense reveals a much more menacing threat standing just out of sight. Indeed, this is a story that realistically could only work within this particular time frame with this burgeoning technology capturing the public’s imagination and with the sense of mystique underlying the known science that casts recognisable concepts in a new light both making for a brilliantly realised visual that straddles the line between familiar and unfamiliar expertly. Christopher Benjamin and Trevor Baxter are at their very best here, able to bring out a sense of wounded pride when their investigations take a most unexpected turn but never forgetting the inherent bravery, empathy, and complementary intelligence that make their characters so affable. It is quite rare in this range for a guest character to find equal footing with the charismatic leads, but Nigel Whitmey’s cinematographer Robert W Paul undergoes an exemplary character arc in a short period of time that takes him from a one-note profiteer to a well-developed and nuanced man as he actively becomes involved with the exploration into the strange goings-on that he is so uniquely equipped to uncover once he sees the evidence hiding before him. So although the plot is fairly straightforward, the superb characterisation, unsettling visual threat, and incredibly evocative set pieces as the investigation delves into local history help to create another memorable adventure that uses its period setting to full effect. Acting on a tip suggesting a possible source for the vampiric murders plaguing the city, Jago and Litefoot investigate a girls’ school in Paul Morris’s ‘School of Blood.’ This continues this series’s trend of taking the two intrepid explorers to locations they do not seem to regularly frequent, and Morris initially has some good fun with the fish-out-of-water concept as Litefoot inadvertently finds himself applying to be the needed science teacher and Jago reacts by accepting the position of caretaker, positions left vacant following the mysterious deaths or seeming disappearances to their previous occupants. The different nature of these two positions brings with it an intimated but only briefly discussed difference between where each hero sees himself in societal standing compared to the other, but it becomes clear even from day one that something amiss is going on within the school’s boundaries that has not made its way into the public forum. In a short period of time, the school is brought to life quite vividly by the strong performances of Ronan Vibert as religion teacher Mr Ravener alongside Niky Wardley and Charlie Hayes as respective schoolgirls Hannah Bennet and Lucilla Fredericks who have their own secrets, effectively capturing both the solemn and mischievous aspects of just such an esteemed location of learning. In a story about vampires where seemingly every little detail is included specifically to shroud the truth with red herrings, the ultimate revelation that strikes at the very heart of vampire lore and history is stunningly poignant and effectively puts everything that has come before it in a new context while simultaneously hinting at much darker events on the horizon for Ellie, Jago, and Litefoot. Truly, Lisa Bowerman continues to excel as this slightly more furtive version of her beloved barmaid, and the fact that she knows at least part of the truth regarding the hidden involvement of her friends in her own past while she appears to willingly accept her vampiric nature is sure to pay immense dividends as she continues to fill in the blanks of her own accord. A nonconformist within a distinctly heightened group may by itself not be the most creative basis for a story, but the incredible emotion and dark finale that result from the deepening and twisting mystery make this a powerful setup piece that benefits from both comedic and sombre turns from its compelling leads. ‘Warm Blood’ by Justin Richards brings the burgeoning suspicion of Ellie to the forefront as Jago and Litefoot furtively attempt but fail to find an alibi for Ellie during the recorded times of recent mysterious murders. As the two stake out the Red Tavern and stealthily track their friend through the dark streets, Richards manages to create an immensely tense atmosphere even as the two heroes realise they’re not quite as proficient with pursuing as they believed by continuing to flesh out Ellie’s dangerous involvement with the Old One that brings her friends ever closer to their demise. There’s no question that Ellie has been an integral part of the investigators’ success over the previous eleven-plus series even as she has remained in more of a supportive role for the vast majority, but Lisa Bowerman again deserves full credit for making her character’s darker turn a tragic and nuanced one packed with both subtle and overt emotions that make the ultimate redemption all the more rewarding. Precisely because this threat is so personal and hits so close to home, Ellie as a dark figure is arguably the most effective villain of the range yet solely because of how her relationship with Jago and Litefoot is able to blind them to her true intent, and the dawning realisation of her cold-blooded betrayal is played magnificently by both Benjamin and Baxter. Indeed, this is a story that takes all of its leads squarely out of their comfort zones, and each steps up admirably to help craft one of the most emotional and heartrending finales this range has ever offered. Although it does seem a bit awkward that Ellie did not study the contents of her stolen painting thoroughly and then would not give her friends the benefit of the doubt to at least ask them about their knowledge of the events surrounding her brother’s demise given all that they have been through together, the blinding power of emotions is a strong motivational force and expertly ties in the opening of ‘Picture This’ to remarkable effect to create a thoroughly satisfying sense of scale and closure to this vampiric arc. 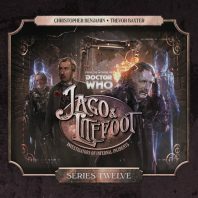 As a whole, series twelve of Jago & Litefoot is hardly the most inventive, but it presents four stories that confidently lay out a perfect roadmap of everything that has made this vivid and emotive range so popular over the years. With the danger at its most personal as emotional events from the very beginning again rear their head, this has all the makings of a final series of adventures (a thirteenth is coming) that rewards long-term listeners and that again excels with stellar writing, acting, direction, and sound design to once more bring the perilous shadows and corners of Victorian London to life.